Trees reduce air pollution, improve water quality, save energy costs, reduce storm water runoff and enhance property values. And some would say Charlotte’s tree canopy also shapes the soul of the city. 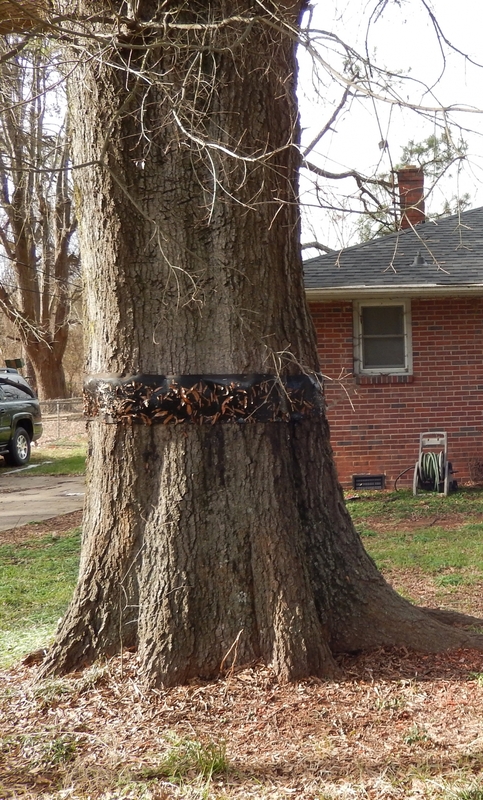 In Charlotte, a widespread passion about trees inspires a special sort of community activism, marked by a keen admiration of the beauty of trees and pragmatism about protecting their environmental significance to the city. One teacher’s fondness for trees led her to write a guidebook on Charlotte’s Treasure Trees, a collection of 123 trees designated as having special physical characteristics or historical importance. Some local arborists for tree service companies regularly volunteer pruning and other skills to help take care of ailing trees. Business leaders, asked to support an initiative to provide free trees to schools and less affluent neighborhoods, have donated more than $2 million. Trees help reduce air pollution, improve water quality, reduce heating and cooling costs, reduce storm water runoff and enhance property values. Some would say Charlotte’s tree canopy also shapes the soul of the city. 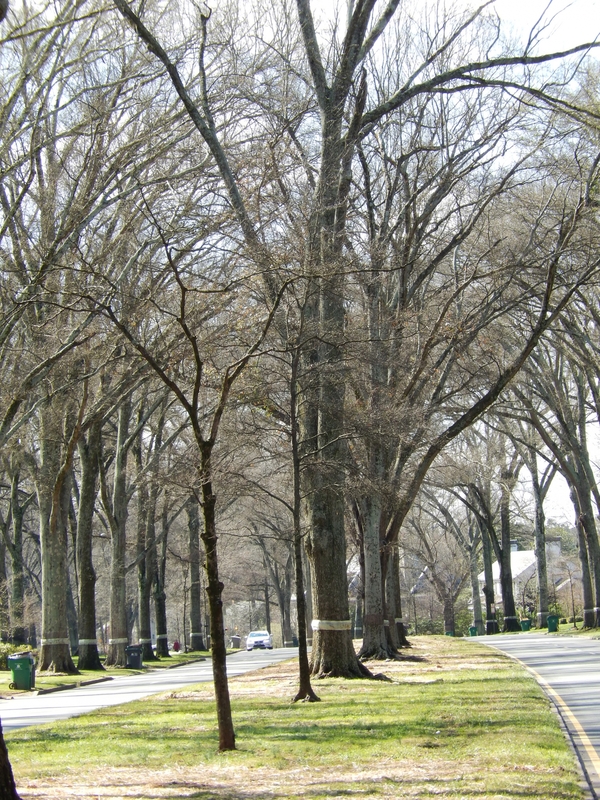 Along the curving Queens Road West in Myers Park, one of the oldest and most affluent neighborhoods in Charlotte, towering willow oaks create a cathedral-like effect that has become the poster child for the majesty of the city’s tree canopy. Similar tree-lined streets crisscross the city—in Grier Heights, a historically African American neighborhood near uptown; in Dilworth, the city’s first streetcar suburb; and in other communities built during the early 20th century and in later years. Residents protest loudly when favored public trees are threatened. Among the more contentious fights, residents nearly a decade ago successfully campaigned against county plans to cut down some troubled cherry trees in Freedom Park, a 98-acre center city green space near some of Charlotte’s historic neighborhoods. Across the country, Charlotte’s tree canopy is recognized as one of the best urban forests in the nation. In a 2013 survey, the national conservation group American Forests ranked Charlotte among the top 10 cities, based on the overall health of the city’s trees, city government strategies for dealing with trees and civic engagement to help preserve the tree canopy. For 35 years in a row, Charlotte has been named a Tree City USA by the Arbor Day Foundation. With Charlotte one of the fastest growing cities in the country, trees are continuously bulldozed to make way for new apartments, houses, restaurants, stores and office buildings, not to mention for streets, highways and other public works projects. In response to studies showing that the tree canopy was disappearing faster than it was being replanted, the Charlotte City Council in 2011 adopted a “50 percent by 2050” policy to increase tree coverage across the city. “Charlotte is growing so fast that it is going to be tough to get there,” says Porter. It would require planting at least 500,000 trees over the next few decades. Several studies indicated that from 2002 to 2008, the city’s tree canopy declined from 48 percent to 46 percent of total land area. In 2008, using a different method of measurement, tree coverage was calculated at 48 percent. The most recent analysis of the canopy, described as the most revealing look at the city’s treescape because of new aerial technology, found a 47 percent tree canopy in Charlotte and 51 percent in Mecklenburg County. Conducted by the University of Vermont and released in 2014, the study was based on 2012 data and calculated the tree canopy for each parcel of land in the city and county. Not unexpectedly, the most dense tree canopy is in higher-income areas, primarily in south and east Charlotte neighborhoods. 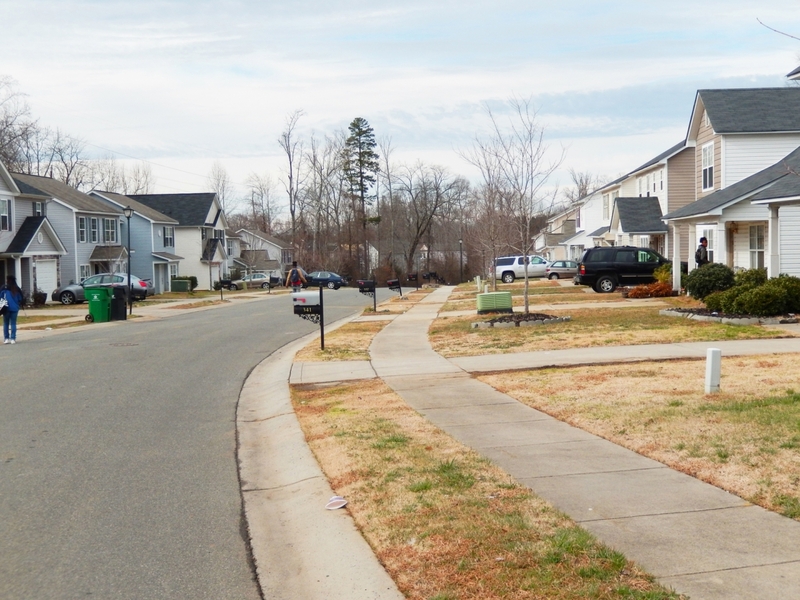 Areas where the tree canopy has been ranked as critically low include some communities south of Interstate 485 and to the southwest in the Steele Creek area, where the city has experienced some of its most intense development over the past two decades. As part of the “50 percent by 2050” initiative, the city will begin this spring to develop a masterplan for managing and preserving the tree canopy. This Urban Forest Masterplan will include an evaluation of the city’s tree ordinance as well as a survey of community sentiment on strategies for tree management. It will be the city’s most comprehensive plan for preserving and enhancing a tree canopy that has become Charlotte’s trademark. Early 20th-century developers and architects took some of the first steps to focus on trees as they built Myers Park and Dilworth, in some cases hauling in large trees from other areas for those neighborhood streets. Willow oaks, the trees that dominate Myers Park, were once the most dominant tree species in Charlotte, but they have been pushed to No. 2 by the popular crape myrtle. The other top tree species are red maple, callery (Bradford) pear and flowering dogwood. 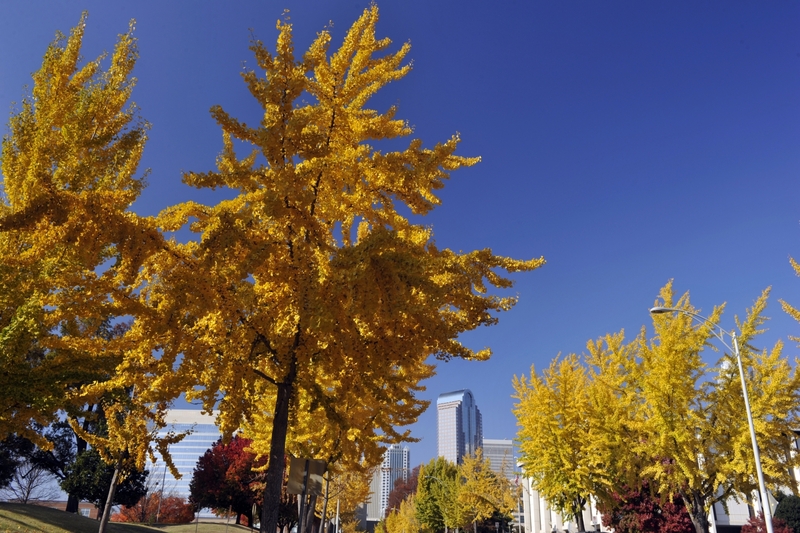 Those five tree species comprise 51 percent of the trees in Charlotte. While there are more than 230 species across the city, officials are trying to increase the diversity of trees by planting fewer of today’s top species. A larger variety of trees is being planted along public streets and being offered free to residents through the public-private partnership with TreesCharlotte. A stronger mix of tree species, officials say, will strengthen the overall canopy and contribute to its longevity. Too many trees of only one species can leave the city vulnerable if a species-disease such as Dutch elm disease were to infest Charlotte’s trees. While the aesthetic value of trees is unquestioned, their specific environmental impact in Charlotte often is little known. Locally, officials estimate trees prevent at least 9,000 pounds of air pollution and reduce carbon dioxide by 35 million pounds. City residents save an estimated $1.04 million annually in heating and cooling costs, with the greatest amounts of savings provided by willow oaks. When it rains, trees intercept an estimated 2.7 million gallons of storm water generated by development. The aesthetic value of trees increased residential property values by more than $4 million. On a crisp Saturday morning in January, Scott and Alexis Ewing and their 5-year-old son Sam decided what trees they wanted for their yard and then watched as a volunteer showed them the correct way to plant them. The Ewings live in Eastway Park, just off Independence Boulevard in east Charlotte, and their neighborhood had signed up for a free tree giveaway through TreesCharlotte. “I’m looking forward to putting some trees in the back yard,” says Alexis, describing a space that already has some large, old trees but needs some new growth. 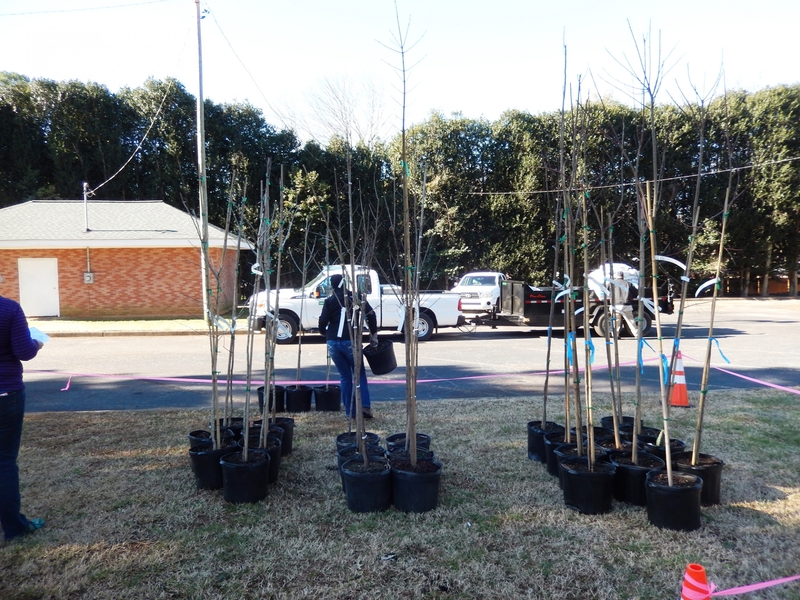 Providing trees for residents to plant on private property is a cornerstone of the public-private partnership between TreesCharlotte and the city. Public street trees represent only about 10 percent of the tree canopy, and the collaboration between the two agencies provides a way to put trees where they are needed most. The city provides administrative support to the effort; TreesCharlotte buys the trees. Since 2012, TreesCharlotte has facilitated the planting of 14,634 trees, all between 6 and 7 feet tall, and distributed 12,296 seedlings. It has sponsored tree plantings in 27 neighborhoods, 27 schools, nine parks as well as 10 faith institutions and housing projects. The organization annually revisits some areas where trees were planted to ensure they have survived and to replant where they didn’t. The group focuses on less affluent areas and relies heavily on neighborhood associations to spread word among neighbors, who must register in advance for trees. Several events are held annually, open to any city resident. As part of its mission, TreesCharlotte is developing an educational program for schools. This spring, the nonprofit also will launch a $10 million endowment campaign. Is city tree ordinance tough enough? The city also oversees tree removal from development, and opinions vary on whether city guidelines are tough enough. City officials, however, say Charlotte has one of the more restrictive tree ordinances in the country. Under the ordinance, which was revised in 2010 after considerable community debate, at least 15 percent of existing trees in new developments must be saved, and new trees that are planted must include a diversity of species. It includes guidelines for tree planting in parking lots as well as along streets in new subdivisions. The ordinance provides an option to let developers pay a certain amount of money in order to be allowed to remove some trees. In the past two years, as development increased after the 2008 economic downturn, more builders sought the payment option, resulting in an average $130,000 a month paid into a year-old Tree Canopy Preservation Program. According to Porter, more than $1 million is expected in 2016. Officials use the money to buy wooded areas that will be permanently protected. So far, 65 acres have been purchased, including a nearly 50-acre site off Brookshire Boulevard in west Charlotte and 15 acres near the McAlpine Creek Greenway. “My preference would be that people preserve trees on site, but we have to deal with the realities of development,” say Porter, explaining that the preservation program still offers a way for the city to move toward its 50 percent by 2050 goal. Will the city be able to plant, protect and preserve enough trees to have a 50 percent tree canopy in 34 years? Not without a lot of effort.